Andy started with the Peel Regional Police in 1998 at the age of 29 after spending 10 years with the Canadian Armed Forces. He then transitioned to York Regional Police in 2000 and since then has worked in a variety of units including Frontline Patrol, Emergency Response, CIB, Intelligence, Guns and Gangs, Biker Enforcement (OPP Secondment), Protective services and his current position at the Training and Education Bureau Academics, overseeing the recruit training program. 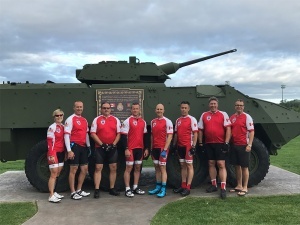 After completing the 2017 Wounded Warriors Highway of Heroes ride and participating in the 2018 Wounded Warriors Battlefield ride in Bosnia, it encouraged Andy to participate in the Ride to Remember this year. He is looking forward to the challenge and paying tribute to those that fell in the line of duty. When asked why he rides, Sergeant Cook shared that he was on the same shift as fallen Constable Garrett Styles after returning to the road from ERU and fallen Detective Constable Rob Plunkett worked in the same office with Sergeant Cook when they were both in Intelligence Unit. 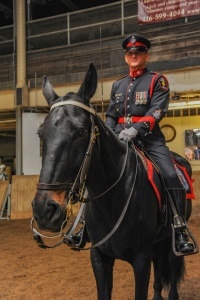 One of the defining moments in his career was creating and maintaining a Ceremonial Mounted Unit; YRP in its history has never had or used horses, so creating something like this was not only new, but challenging and exciting. In 2014, a functional Ceremonial Mounted Unit was unveiled and has regularly participated in up to 20 events around the region every year since its inception. Andy also served with the Strathcona Battle group in Visiko Bosnia in the 1994, which by all accounts was to bear witness to genocide of the Bosnian people. Returning to the Balkans in 2018 to do the Battlefield ride from Sarajevo to Gospic valley is both a physical and emotional challenge. Andy always strives to honour the fallen and help the living. He is currently in Bosnia, participating in the Wounded Warriors Canada Battlefield ride. Here, we share an impactful interview of Andy overseas and his experience while serving his country. ← Thank You Bulk Barn!